Gold markets are under investigation by regulators, again. At one level nobody should be surprised that banks are constantly in the firing line for regulatory intervention. They brought it on themseleves. At another level ,one might wonder when investigations reach diminishing marginal returns. As ever Zerohedge, long on tinfoil millinery, is frothing and fretting. This time it seems that the investigation is on whether or not a set of swiss based banks engaged in manipulation of the bid-ask spread in gold and other PM markets. a) Its not clear if this is confined only to the OTC market or to the futures market. It SEEMS to be OTC from my reading. In which case, while the banks may indeed, or may not, have engaged in bid stuffing or some other shenanigans, we might not care that much. The prevailing academic research strongly points to futures markets, in this case the NY markets, as being by far and away the dominant force in price setting. See this paper, under second round review at a leading journal. Playing around with the bid-ask spread in the OTC market may make a few million, but its not going to set the price to a level any different to that which is determined by the futures market. Below see the evolution of the OTC vs futures markets spread over time. 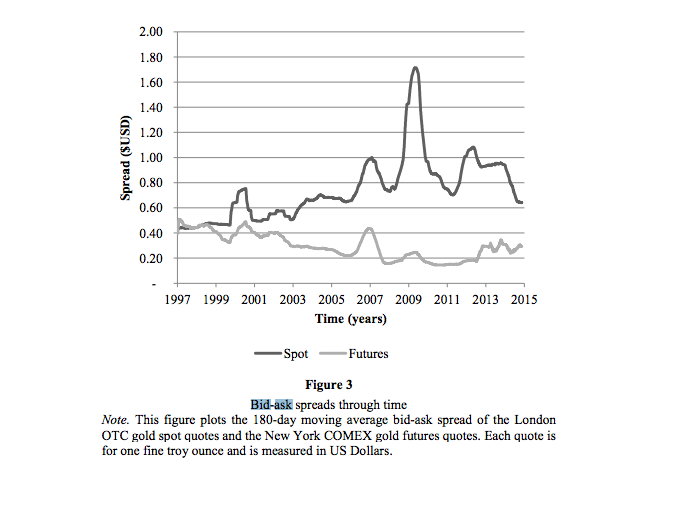 c) No, probably the central banks are not manipulating the price of gold. d) There is no strong evidence of benchmark rigging. Market design probably accounts for more patterns than actual manipulation could. So, lets wait and see. Would it surprise me if some traders were colluding – no. Would it matter in terms of the ‘true’ price of gold – no. Do some research. Evaluate http://www.gata.org and have a Chris Powell. Tony I think I do little but research. So how do you explain prolonged periods of negative GOFO rates?